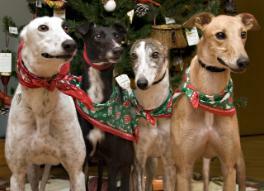 The first week of December 2009, TAGS received its first four Greyhounds – Harry, Betsy, Maggie and Jazz. TAGS’ first adoption was Maggie, on January 30, 2010 to Sara and Aaron Cox. Since that time, TAGS has been steadily and successfully finding lifetime homes for its Greyhounds. In 2010 TAGS had 12 adoptions; in 2011 it had 14 adoptions; and through December 1, 2012, TAGS has had 26 adoptions in 2012. TAGS received its 50th Greyhound, Lovie, on November 30, 2012. TAGS looks forward to many more success stories in years to come. Thanks to all who have loved the TAGS Greyhounds. Bark Magazine has chosen the picture of 4 TAGS Greyhounds for their weekly Web Smiling Dog slideshow (web only). View the slideshow at this link. This event included TAGS and Operation Kindness. Reported in D Magazine Side Dish.